It isn't possible to get inside animals' bodies and experience the world exactly as they do, but it is possible to draw conclusions based on anatomy and behavior. Starfish certainly do feel -- they sense their environment, they learn from it and they interpret sensory input to seek out food and company, sense danger and avoid pain. Starfish are members of the phylum echinodermata -- "spiny skins." These animals are full of contradictions. They're invertebrates that have internal skeletons of bony plates. They don't have head, central brains or spinal cords, yet they're more closely related to vertebrates -- like us -- than to other invertebrates. Most puzzling of all, echinoderms evolved into headless, crawling forms with five or more arms from a bilateral ancestor that had matching left and right sides and possibly a head. Zoologists are certain echinoderms have a bilateral ancestor because starfish larvae are bilateral. Bilateral symmetry is associated with development of a head and brain. Adult starfish have radial symmetry -- "arms" that radiate out from a central mass. Each appendage contains portions of all body systems -- guts, gonads and sense organs. It's easy to look at this and assume they lack neurological ability because they don't have a central nervous system, but it turns out they have something else entirely that works just as well. Instead of one central brain, starfish have a series of neural plexi, or nerve nets. These are like interconnected miniature brains that run different parts of the body while communicating with each other. Each has a central nerve ring that circles the middle body, radial nerves extending along each arm, and branching nerves permeating tissues. Exactly which plexus controls what isn't completely understood, but zoologists agree starfish have at least three: the visceral plexus, the basiepithelial plexus and the mucosal neuroendocrine plexus -- these are also called ectoneural, hyponeural and entoneural plexi, as well as oral, deep oral and aboral plexi. In 2001, researchers at the University of Puerto Rico proposed a fourth, the connective tissue plexus, in "The Journal of Experimental Biology." In addition to through their internal plexi, starfish feel through their peripheral nervous system, the sense organs. Each limb has ocelli -- tiny "eyes" that sense light, shape and motion -- and sensory tentacles that feel by touch. 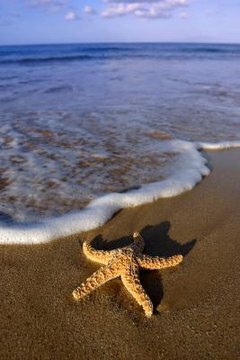 Starfish also have receptors throughout their skin that sense pressure, temperature and pain much as ours do. Their skin has chemoreceptors, which give them the extremely well-developed sense of smell they use to hunt prey and avoid predators.